An unknown alien trapped on Earth. A small sympathetic group protecting it. A governmental group looking for it. We have seen these plot points play out in movies for years and years. From "E.T." to "Close Encounters" to "Super 8" just a few years ago. I love that there can something more to a alien on earth story than just the typical, aliens are bad and they are going to invade us. I have been just as drawn to the idea that something accidentally came to us, and they just want to go home. Even though our world leaders would make that next to impossible for them. I love it, but it has been overdone over the years. 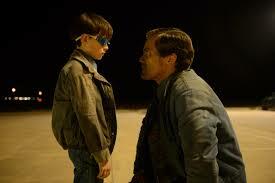 "Midnight Special" feels like that sort of movie. There is a little boy named Alton (Jaeden Lieberher) who is on the run with his father Roy (Michael Shannon) and his best friend Lucas (Joel Edgerton). Alton is capable of magnificent things, and he is going to do something special on a certain day, and Roy plans to make sure he gets to where he needs to be. The government is trying to track Alton down. Roy can't let that happen, Alton has a very specific engagement at a very specific time on a very specific date. If Alton does not make it, things could go very bad for us. Of course, that sounds familiar. But "Midnight Special" takes on a road you don't necessarily expect. Its a movie that feels all too familiar, while also being completely different at the same time. Yes, Alton is not from our planet and he is on the run, but he may not exactly be an alien. Yes, the government is after Alton, but perhaps not for power or greed or conquest. Yes, Roy is Alton's father. Or is he? Its never really confirmed if Roy adopted the boy or helped make him. Alton has a mother named Sarah played by Kirsten Dunst. But when we see Sarah and Roy interact in the movie, they come off as if they just met. I have not got into the characters that Sam Shepard, Paul Sparks and Adam Driver play. But you must know that the less you know about this, the more enriching it will be. The film was written and directed by Jeff Nichols. This is the fourth film he has made. I haven't seen "Shotgun Stories" yet. But I have seen "Mud" and "Take Shelter," a pair of films that flattened me the first time I saw both of them. I can tell with confidence that Jeff Nichols is a rising talent that should be put on everyone's radar. He has a dedication to craft, mood and atmosphere in his previous films, and "Midnight Special" is no different. There is a wonderful use of music in this film. All the performances are top-notch. The very minimal use of special effects in the film is just enough that this film feels authentic and real, even though there are some clear otherworldly things going on in it. I also love how Nichols played with expectations of the genre, but also made something that is exclusively original. Never an easy thing to pull off, and he made it look effortless. I loved seeing Michael Shannon reunite with Nichols. In "Midnight Special," he is playing a very different character compared to the one he played in "Take Shelter." But that just shows the profound range Shannon possesses. Edgerton, Dunst, Shepard, Driver and Sparks are all very good in their roles. But in a movie like this, you have to cast the right child. I have to say that Nichols made a slam dunk when he hired Jaeden Lieberher to play Alton. I love that he isn't the typical scared, frail child we usually see in this movie. Alton has some real personality, and I enjoyed watching Lieberher play with that. I can't wait to see what this young man does next. Expertly crafted, impressively set-up, beautifully shot and wonderfully acted, "Midnight Special" is the best film of the year. Watch out for Jeff Nichols.